UK frozen food manufacturer Birds Eye is targeting the adult market with the launch of its latest take on frozen fish cakes. Melt-in-the-middle fish cakes are part of a revamp of the firm's adult dining portfolio and are designed as a "midweek meal solution", Birds Eye, owned by Iglo Group, said. The fish cakes are available in two variants: Cod, Tomato & Herb; and Haddock & Creamy Cheese. Alongside the fish cake launch, Birds Eye has added to its steam veg line with the launch of Veg Fusions - a pyramid bag of green vegetables with a hint of garlic and herbs. The products is available in packs of two. "The addition of Veg Fusions and Melt in the Middle Fish Cakes to our adult dining portfolio is an exciting development for Birds Eye," said general marketing manager Helen Martin. "With these new ranges Birds Eye aims to revolutionise mealtimes, making it easier to enjoy delicious dinners during the week." 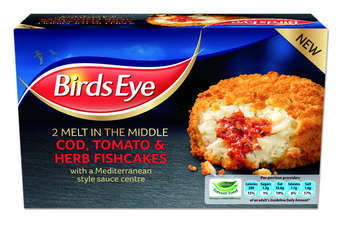 Birds Eye, the UK’s leading frozen food brand, is revamping its Adult Dining portfolio this autumn with the announcement of two new product developments with the introduction of ‘Veg Fusions’ and ‘Melt in the Middle Fish Cakes’. Both new products offer innovative and exciting midweek meal solutions for Brits who are currently, on average, eating just six different meals per fortnight. The introduction of Veg Fusions and Melt in the Middle Fish Cakes presents a variety of meal choices to adult diners looking for a quick and easy meal without sacrificing on flavour and quality. Following on from the success of its predecessor, Rice Fusions, Veg Fusions is an exciting new way to enjoy vegetables combining the best field-fresh vegetables with authentic herbs and seasonings. Thanks to the unique pyramid steamer, vegetables are steamed to perfection every time within a matter of minutes. Melt in the Middle Fish Cakes offer an innovative new way to enjoy fish combining the best quality fish with complementary flavours. The products will be available in two delicious flavours: Cod, Tomato & Herb and Haddock & Creamy Cheese. Quick and easy to prepare, Melt in the Middle Fish Cakes provide a delicious choice suitable for any meal time. The flavoursome Veg Fusions and the Melt in the Middle Fish Cakes are aimed to relieve the boredom of midweek meals by offering a variety of exciting meal choices to create the ideal adult dining experience. These two new products inspire adults to move away from their usual meal choices from the current UK average of just six different meals per fortnight and make more of their midweek dining.